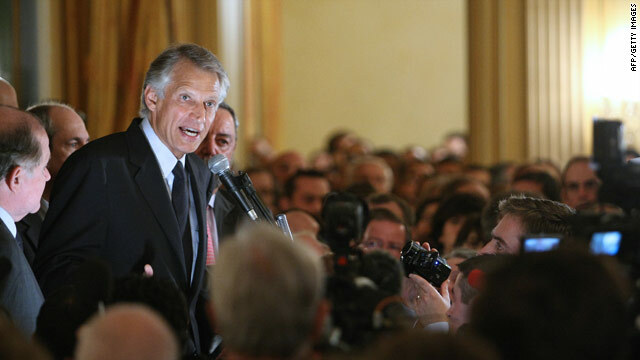 Dominique de Villepin addresses supporters in October 2009. Paris, France (CNN) -- Former Prime Minister Dominique de Villepin has been found not guilty by a court Thursday in an alleged smear campaign against longtime political rival and current President Nicolas Sarkozy. De Villepin had been accused of complicity to slander, complicity to use forgeries, dealing in stolen property and breach of trust. Prosecutors accused de Villepin of engineering the distribution of a fake list of secret accounts at Clearstream, a bank clearinghouse based in Luxembourg. The list appeared to link several French politicians, including Sarkozy, to kickbacks in 1991. The trial began in September and, coincidentally, the verdict came down on Sarkozy's 55th birthday. In 2004, he and de Villepin were jockeying for position to succeed then-President Jacques Chirac in the 2007 election. Both men served in Chirac's Cabinet at the time. De Villepin faced a maximum five-year prison term, though prosecutors had asked for an 18-month suspended sentence and a 45,000 euro ($63,325) fine.